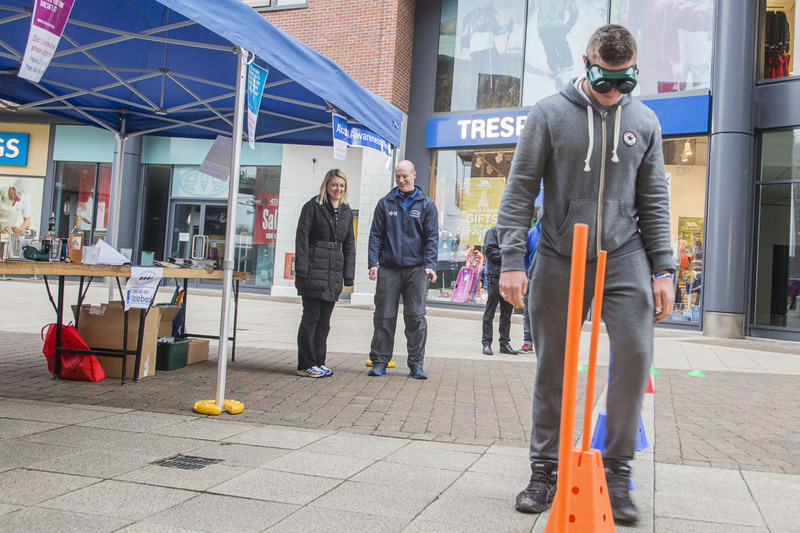 Shoppers in Wrexham tackled an obstacle course whilst wearing beer goggles designed to recreate the effects of being drunk. 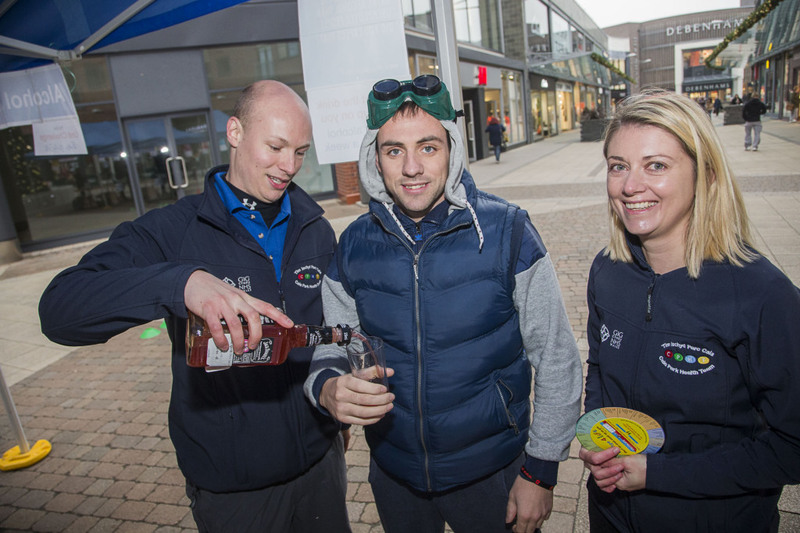 Members of the Caia Park Health Team threw down the gauntlet to shoppers at the town’s Eagles Meadow shopping centre as part of a campaign to raise awareness of alcohol related issues. 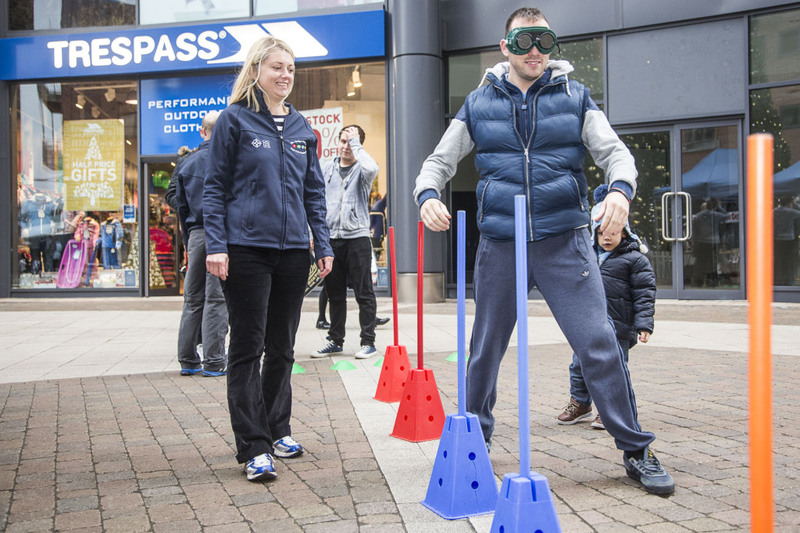 The challenge was to navigate the obstacle course, laden with cones and barriers with the specially-designed goggles on. 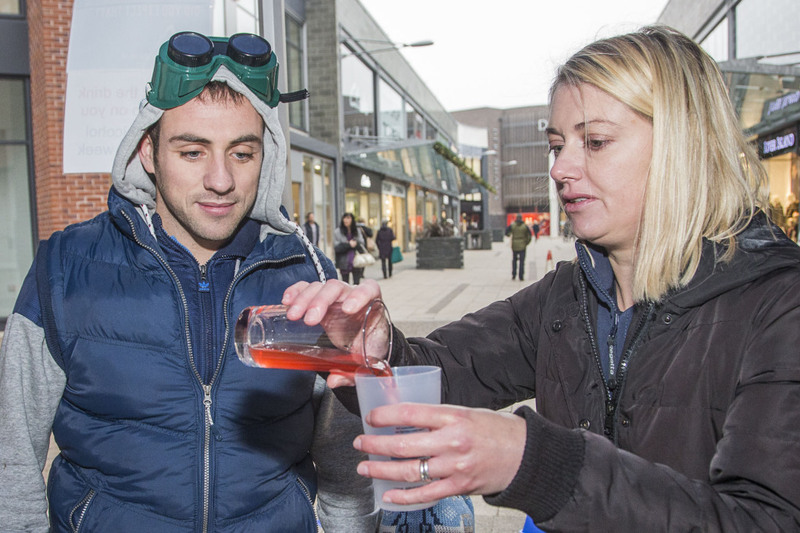 The Caia Park team also gave out information booklets and alcohol unit measurers – which can be screwed on the top of a bottle to control how much you pour – to help people avoid the dangers of over-drinking. 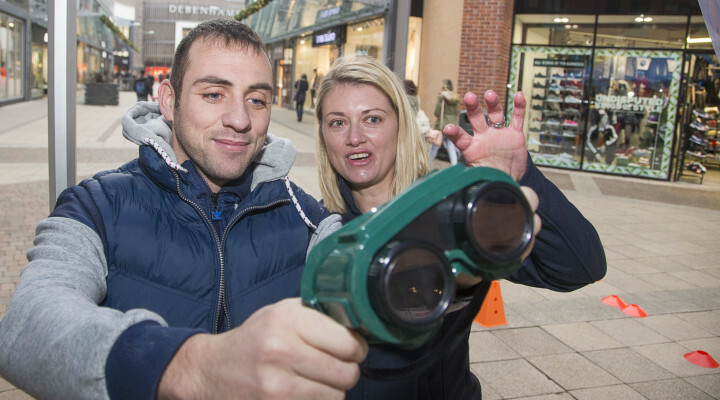 JCB Driver, Kevin Lovell, 30, from Wrexham, was keen to give it a go. 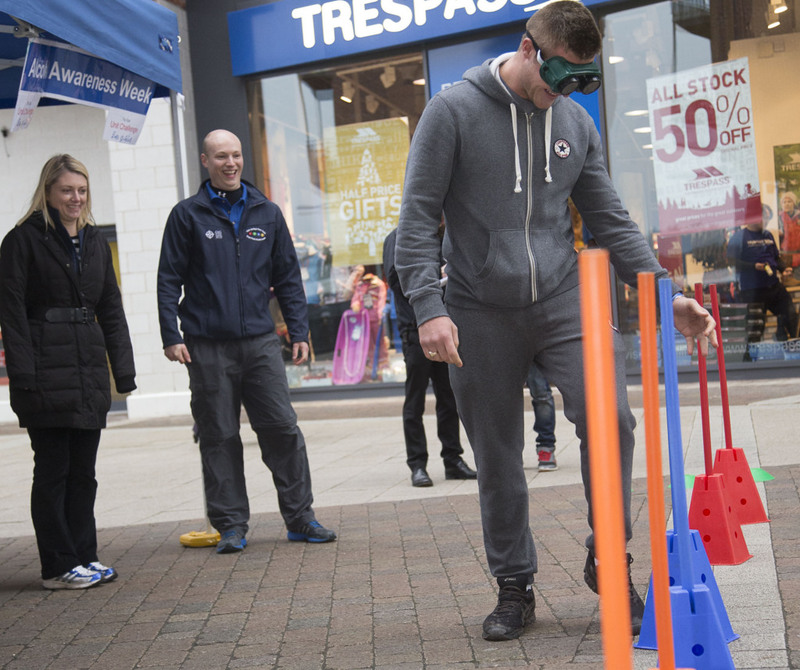 Another Eagles Meadow shopper who took on the obstacle course was Gary Yarwood, 25, from Wrexham. He said: “It’s quite realistic. I thought it was going to be a bit naff but it did actually feel like you were under the influence. 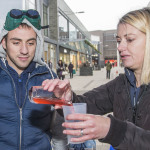 Health Improvement Advisor Nina Patterson was on hand with useful tips for shoppers at Eagles Meadow. She said: “We get people to pour the amount they normally would when drinking at home. Then we show them how many units of alcohol that would be, and how many calories. “There are a lot of calories in many alcoholic drinks, and that can often be an incentive for people who want to cut down on their drinking. 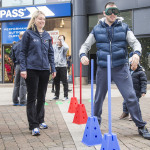 Robin Ranson, Health Improvement Practitioner at Caia Park Health Team, said: “It’s just a fun way of engaging people. 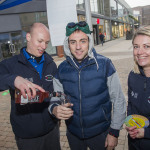 “For us the campaign is about connecting with people and making them aware of the issues related to alcohol. “Eagles Meadow is a great place for us to come because there’s such a big audience. It’s a very popular place because of all of the shops and the cafes. 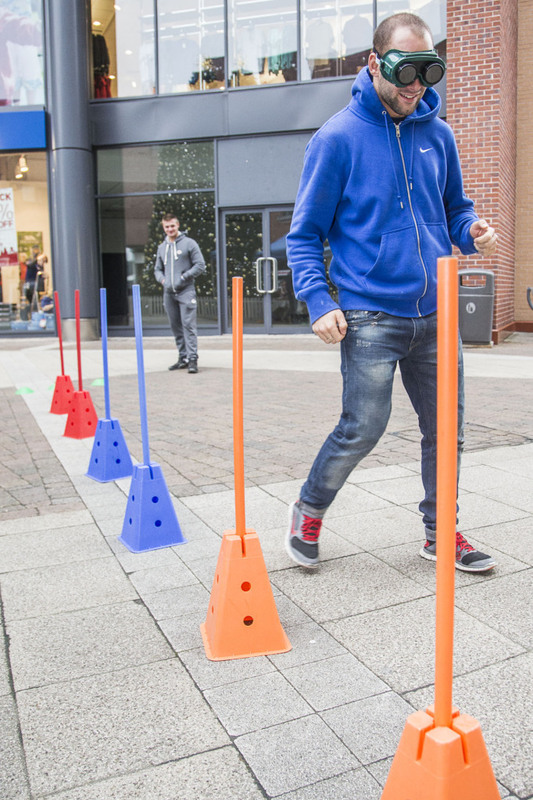 There’s a lot of footfall. 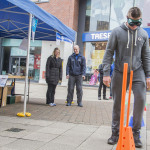 “We promoted Stoptober the anti-smoking campaign, here recently and that was really successful. “We want to make sure that people have access to the right information, have an opportunity to engage with it, and we can point them in the right direction if they want help. Dealing with alcohol related issues costs the NHS Wales over £80 million a year. But most people with drink related health problems are not addicted to alcohol. They’re people who have drunk more than the guidelines for a number of years. According to the lower risk guidelines women should not regularly drink more than two to three units of alcohol a day and men should not regularly drink more than three to four units a day. Everyone should aim to have at least two alcohol free days a week. Failure to stick the guidelines increases the risk of cancer of the mouth, throat, oesophagus or larynx, and breast cancer in women. It also increases the risk of a stroke, heart disease, high blood pressure, liver disease, pancreatic and reduced fertility. Eagles Meadow Manager Kevin Critchley is pleased to be able to help. 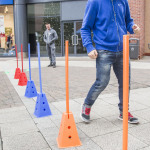 This entry was posted in Community, Education, Entertainment, Health, News. Bookmark the permalink.